We leave the caravan park at Seisia at 9:15 am and head north for the tip of Australia. We arrive at Pajinka at about 10 am. We walk to Cape York. It is a few kilometres, but it is an easy walk. 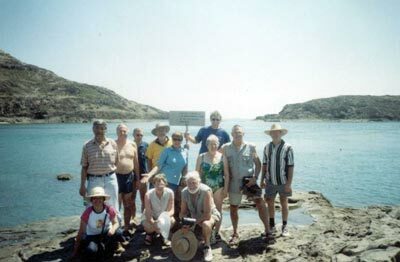 The last bit is across the rock platform and when you arrive at the tip of mainland Australia, there is a very simple sign stating where you are and the latitude and longitude. Daryl, Irmgard and I go for a swim in the water (very quick as the water is a bit dirty and there is the real possibility of crocodiles). I can now say that I have swum off the eastern and northern most part of mainland Australia. We walk back to the carpark along the beach rather than the way we came. This is not as quick but it is more interesting. We drive the short distance to the Pajinka Resort. This is not running now (2007) but back then it was a nice resort. 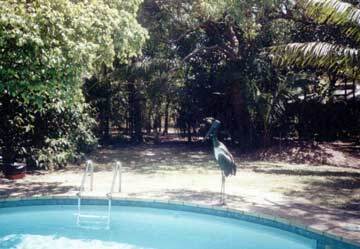 As we enter the resort we see a large bird statue next to the swimming pool. We purchase a beer and sit down next to the pool. The statue moves!! Hell, this is not a statue. It is a real bird. It is huge!! It is a jabiru, the only Australian native stork. The 5th RAR group is also here. From here we head to Somerset. This was the location of a very ambitious settlement in the early 1800s. There are even still the remains of old roads and buildings. There are some nice camping areas if you wanted to stop here. We arrive at 1:30 pm. 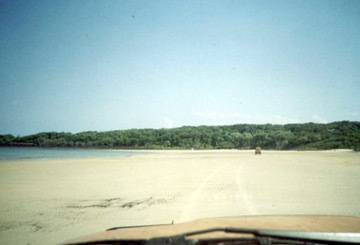 We continue on to the beach on the eastern side of Cape York. It is a very rough track but the beach is excellent. There are some small sharks swimming in the shallows. We have lunch here (GPS 10º 45' 17"S 142º 36' 05"E using AUS66 as a datum). This beach is covered with lots of flotsam and jetsam. There are heaps of thongs washed up on the sand. You could camp behind the beach or on the southern headland. We leave at 2:25 pm and travel via the beaches and headlands back to the main road. On the way back we stop at the Croc Shop. This is a place that sells tourist things on the side of the road. It is worth stopping at and checking out. We get back to Seisia at 4:05 pm. We have travelled 61 kilometres today. Both today and yesterday we went fishing at the Seisia Wharf. There are some blokes who are building a water system for the local communities and they are there every afternoon. One specialises in catching bait using a setup with a dozen hooks. He then gives the bait he catches to those fishing. I hook quite a few fish, but lose all of them as my tackle is too light. One day, my whole rod gets pulled over the side of the wharf as soon as I cast it (while I put on suntan lotion). It takes a lot of effort to get it back, using someone else's rod to catch mine! Despite the above, we have some good time fishing and chatting and drinking. Today we are going to Thursday Island, the northern most "town" in Australian. We catch the ferry at 8 am. It takes 65 minutes to get to the island. The cost is a bit expensive, $70. It is a very nice boat. At Thursday Island we walk to Green Hill Fort where there are three six inch guns. This fort was completed in 1893 and was constructed to repel the Russians (like many of those in Sydney). The views from here are quite good. The fort has been restored and there is a military museum there. We walk back to town and went to three of the four (?) pubs. One of these is the Northern Hotel, the northern most hotel in Australia (as of 2005 I have now been to the Eastern most, Southern most and most central hotels as well). We explore the township and end up in the Grand Hotel (the original built in 1890 burnt down in 1993 and was rebuilt in 1996). We have lunch here. We walk back to the wharf and are surprised to see that there is an old sailing ship there. This is the replica of the Duyfken. When I was in Fremantle a few years back I had visited the maritime museum and next door they were building this ship there. We go aboard and are amazed at how small it is. This was the ship that was sailed from Holland to what is now Indonesia and then explored south. It visited Cape York in the 1606 under the command of Willem Janszoon. We get back to Seisia at 3:45 pm. We go and get some supplies from the local supermarket which is much better than the one in Weipa. We also refuel, taking on 71.7 litres at a cost of $71. We have travelled 529 kilometres since Weipa at 13.6 litres/100 km. Either today or tomorrow, Julius leaves us and heads home as his ankle has been diagnosed as being very badly sprained or perhaps he even has a broken bone.